Lancaster Against Pipelines (LAP), yet another lapdog group carrying the fractivist banner for special interests, is trying to tree the Atlantic Sunrise. Inspired by the criminal actions of eco-terrorists in North Dakota, anti-pipeline zealots in Lancaster County, Pennsylvania figured they would give some of the tactics from the Dakotas a try here. So last October they constructed a shed on stilts along the proposed path of the forthcoming Atlantic Sunrise Pipeline. The shed on stilts looks like a big tree house (without the tree), which makes sense as the protesters are the equivalent of seven year-old, petulant, spoiled rotten children. Except that they’re doing the work of some very special interests in a campaign to stop not only the Atlantic Sunrise, but the new Mariner East pipeline and any others. The structure near the tree line of the Landis’ property doesn’t look like much but, if they have their way, it could prove to be a headache for developers of the Atlantic Sunrise natural gas pipeline. Taking a cue from the tactics Native American groups deployed in opposition to the Dakota Access oil pipeline, a group of protesters have erected two stands to block the Atlantic Sunrise’s path. Once completed, the pipeline will transport 1.7 billion cubic feet of gas per day from shale fields to the north and west across central Pennsylvania. It won’t take much effort to tear the wooden structures down, but their builders hope the stands will be the focal point for a protest that could draw hundreds–or possibly thousands–to Lancaster County. Clatterbuck, a Martic Township resident who works as a religion professor at Montclair State University in New Jersey, said the route the pipeline takes is less important than the environmental impacts, including the clearcutting of forest and the risk of future gas leaks. About 200 protesters showed up for the dedication of the first stand in October. The group will hold a second event, with a community bonfire, to celebrate the completion of the second stand on Sunday. In addition to the local opposition, Clatterbuck said he’s been in contact with some of the activists who’ve participated in the Dakota Access encampment. He expects at least some protesters from out of state to join although it’s difficult to predict how many people could be drawn to a similar effort along the Conestoga River. Protesters have already had several run-ins with crews working on the various pipeline projects crossing through the county. In 2015, Clatterbuck faced a disorderly conduct charge for filming the out-of-state license plates of Williams subcontractors. That charge was ultimately dropped. Right. “Nonviolent” civil disobedience. What a load of Barbara Streisand. These people are all about violence if they don’t get their own way, as evidenced by the “protesters” (i.e. bought-and-paid-for criminals) in North Dakota, which the Lancaster group repeatedly references. Notice the hypocritical group of local protesters will assemble and have a bonfire dedication — pumping boatloads of carbon into the atmosphere they say is damaged by carbon from fossil fuels like natural gas. 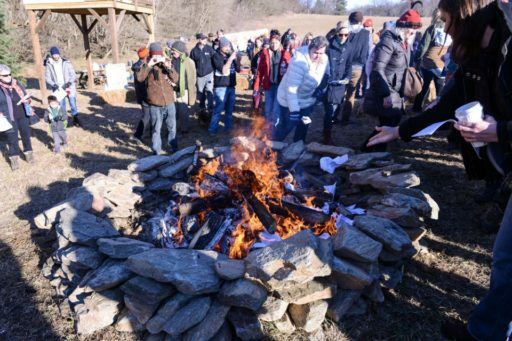 Apparently burning wood, which releases far more carbon than natural gas, is A-OK with the “protesters.” Dolts. Editor’s Note: Jim never leaves any doubt where he stands, which is something I admire. I also couldn’t help but notice some things about Lancaster Against Pipelines (LAP) when I checked out their website and Facebook page. First, it’s clear the group is less NIMBY and more radical than it might otherwise appear. Scan these sites and you’ll find reference to one radical cause after another. If it’s not the pipelines, it’s the fracking and if it’s not the fracking it’s cell towers or the world seed supply. There is even repeated support for the extremist CELDF. Secondly, it appears the group may be working with William Penn Foundation and Heinz Endowments funded groups who frequently rely upon radical attorney Jordan Yeager for legal representation. Yeager was a member of the National Lawyers Guild (a fact now scrubbed from his resume), who represents the Delaware Povertykeeper and loves suing townships who don’t bend to the fractivist will. The LAP website indicates it has hired Yeager’s firm to assist it in its battles at a cost of $50,000 to $100,000. One wonders if they’re getting some help as another page on there website says they’ve only raised $2,044 toward a goal of $10,000. We’ll see when they file a 990 return just how much they raised and spent on legal services (assuming someone else isn’t paying for Yeager). Regardless, it is readily apparent LAP is little more than a LAPdog for these special interests. It attracts NIMBYs who likely, to be sure, know nothing of these relationships, but they’re doing their bidding nonetheless. It’s how fractivism works. If you want to protect it I would advise against turning it into a DAPL sized protest. Those people left a mess of trash, human waste, and trampled down any plants such as grass. Tracy as the property owner you better rethink staging a large long protest there. You’ll end up with a muddy environmental mess you’ll have to pay to clean up. It will leave more damage than the pipeline will. Lancaster County Native Americans extend a heartfelt thank-you to Williams Partners regarding the proposed Atlantic Sunrise project. Thanks for the integrity displayed during decision-making about avoiding Chief’s Hill, a culturally significant area to many. In addition, we extend thanks for the extra effort and integrity far exceeding minimum federal standards and taking into consideration all of the environmental concerns. Williams proposed to protect these interests during the proposed construction phases and reclaim any disturbed property upon completion. We find this approach far more ethical and of genuine interest than that of other companies involved in this industry in the past. It is our hope this positive interaction and thoughtfulness will continue throughout all phases of the proposed installation and construction. In addition, please feel free to call upon us for any insight, suggestions or opinions from an indigenous perspective.